My vegetarian "aha" moment occurred in Kenya. I was there to open a safe house for girls and at the celebration a goat was slaughtered and stewed. I became a vegetarian after that dinner. After eight years of being vegetarian, I went through a "dietary cleanse" and realized I had spent 16 days vegan without realizing it. So I just stayed vegan. What is/talk about your primary Vegan Reason (animal rights, human rights, environmentalism, health)? My veganism is an ethical choice. Why eat, wear, or use animals when I simply don't need to? Talk about your primary occupation(s)! What drew you to it/them? I am a full-time cooking and culinary instructor, cookbook author, and freelance writer and radio show host-- all vegan, all the time. After nearly 30 years in the nonprofit sector, I was led away from my career and found a way to incorporate my vegan passion into my work. I'm livin' the dream! Where do your jobs and your beliefs (vegan and otherwise) intersect? Alternatively, what values are important to you, and how does your work reflect that? Please see above. :) As much as some in the vegan movement poo-poo food activism, the reality is that people are eating 3 to 5 times a day. And most people are eating animals, or their by-products, as often. I teach people to cook because if they can make quick, easy, and delicious plant-based meals, they just might eat fewer animals. You say most of your clients come to you to “make vegan cooking easy.” Did you write The Vegan Air Fryer to combat the stereotype of vegan food being complex and time-consuming to make? Why do you think this stereotype exists? I actually wrote The Vegan Air Fryer because so many people were buying air fryers to fry chicken. I wanted a vegan alternative out in the world. But I do believe that air frying adds a whole new texture to plant-based food that is healthier than traditional frying. Creating a wide variety of cooking techniques, flavors, and textures makes eating vegan complex, flavorful, fun, and never boring. And that helps people keep on the vegan track. What do you hope people take away from reading and making recipes from The Vegan Air Fryer? I want people to see that anything they used to eat, they can now eat vegan (and often healthier). I want people to see that food can look fancy and complicated but can be made in minutes. What’s your best advice to a new vegan or someone considering going vegan? Make a list of all the foods you think you'll miss and then research one or two ways to make - or buy - them vegan. Play in the kitchen, recreating veganized versions of family favorites. You'll soon discover that food is fun and food memories can be recreated. Recipe from The Vegan Air Fryer? 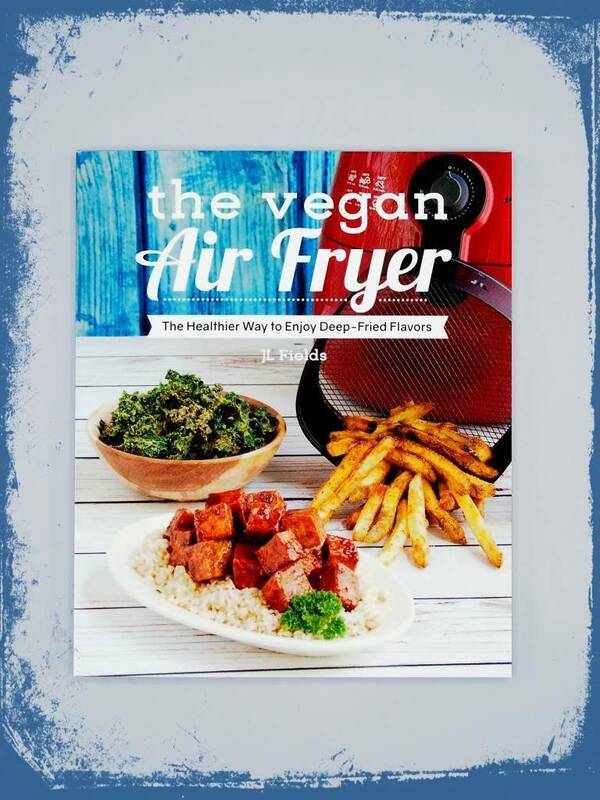 **You can hear more from JL, learn recipes, enjoy snacks, watch cooking demos and more, at the NYC Vegan and Vegan Air Fryer Book Party at The Herbivore Clothing Company! Saturday, August 26th from 12 PM - 3 PM.